KARACHI: Bilal Khan is neither brawny, nor has tattooed beefy arms or matted hair, but he sure loves his Harley Davidson heavy-duty motorcycle that he drives to the mosque to say his prayers every day. Breaking the stereotype of the quintessential Harley Davidson motorcyclists, Khan, who is an IT professional and a member of the Harley Owners Group Pakistan (HOG Pakistan), participated in the Harley Davidson heavy motorcycle rally on Saturday to mark the World Polio Day. 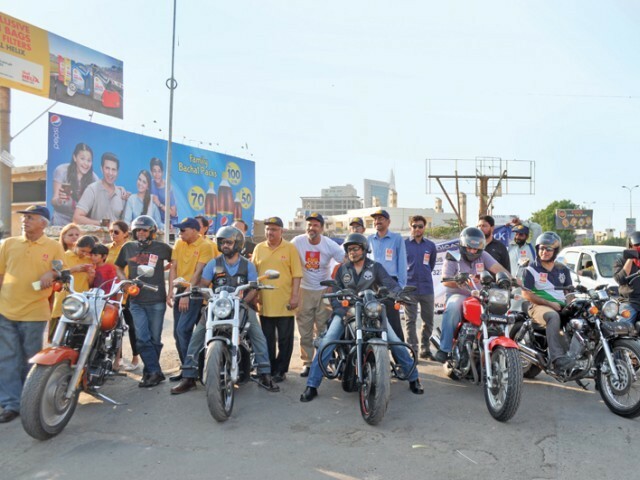 The rally was organised by the Rotary Club Karachi Creek. “We stumbled on to these guys by chance. We were at a club when suddenly this group of motorcyclists revved in. We thought it was a great way to highlight the issue,” Muneeb Khan, president of the Rotary Club Karachi Creek, said. This is the first time members of HOG Pakistan have gotten together to raise awareness about such a cause. They are essentially Harley Davidson enthusiasts and their love of the motorcycles brings them together. “It’s a passion I have had since I was 15,” says Khan. But owning and maintaining a Harley Davidson in Karachi is not without its challenges. “Our biggest problem is security. The motorcyclists in Islamabad and other parts of Pakistan can drive around more securely,” says Asif Altaf, who works in the advertising industry and is one of the founding members of HOG Pakistan. The price of one of these motorcycles can range from Rs1.5 million to Rs4.5 million. “Because it is an expensive vehicle, people stop you on the road and ask how much it costs… that is a bit awkward,” he says. “These motorcycles consume a lot of fuel. We mostly import them from the US. The oil and oil filters for these motorcycles have to be imported too. There is no trained maintenance facility available, so we have had to train local mechanics off manuals.” While they do don the giveaway leather gear, these Harley owners are not your stereotypical motorcyclists. “We’re just regular people… almost all of us are in our 40′s. We have worked hard to give the Harley Davidson bikers of Pakistan a new image,” says Altaf. Yet despite the challenges, these men feel that the trouble is worth it. “The sense of exclusivity and the freedom we feel on our bikes is priceless,” says Altaf. Published in The Express Tribune, October 27th, 2014. Posted in Health and tagged Harley Davidson, HOG Pakistan, Polio Drive Pakistan, Rotary Club Creek Karachi. Bookmark the permalink.